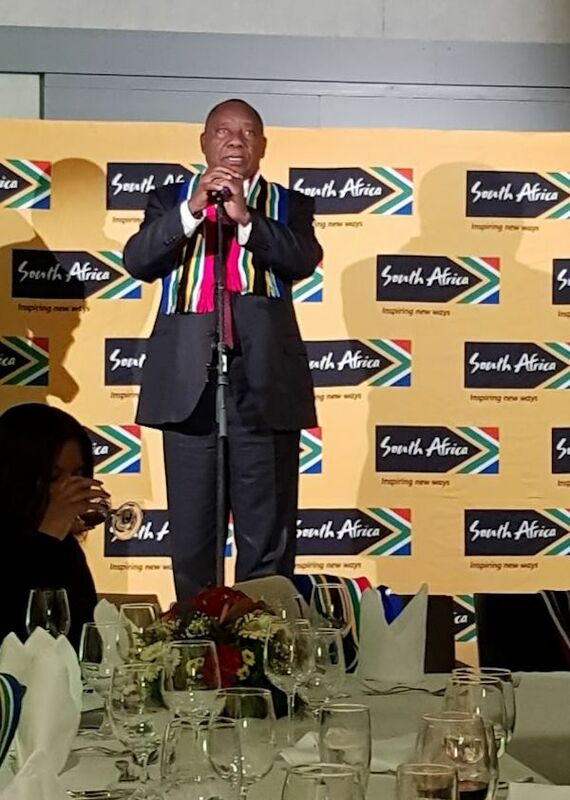 It’s a real joy that you found time to come and join us at this dinner and be with us – a bunch of South Africans. Thank you very much for being here. I also would like to extend my greetings to the Governor or our Central Bank who, after being elevated to such a high position, is strutting across the corridors of the World Economic Forum without wearing a tie. I don’t know whether he’s trying to demonstrate that he’s a person who comes from the rural areas (i.e. Limpopo) or he’s with the people. I think he can take it to a much higher level. It was wonderful to have him in our meeting with Christine Lagarde as we were meeting the IMF and hearing how this had happened from Christine Lagarde filled us with a great deal of pride, particularly when we were told that the other board members come from Africa. They all just unanimously agreed that there was no other candidate to get into the position that has been appointed to other than our own Governor of the Central Bank. My gratitude goes to our partners from a number of other countries who continue to be here with us and really give us a great deal of support in a number of ways. Both obviously, through the investments that you make in our country and those who have not yet invested, for hoping and dreaming and thinking about investing in our country. We thank you for being here and it really elevates the setting of this dinner in a big way. Let’s give those who are not South Africans a round of applause for coming. Now, an evening like this is really an evening for having fun, for enjoying this moment. Let me also say, “Thank you” to our compatriots from the media who continue to come to WEF and bring back home very good and positive messages about our presence here. Whatever we’ve been doing in various discussion groups and so forth, has been beamed back home. We’ve got doyennes of the media like Tim Cohen and a number of others who are here. We want to thank you for being here and for writing all the good stories about our presence here, so we say, “Thank you.” I think this year has been a great year for us as South Africans to be present here. This was in a way, part of a number of events that have taken place. I guess the first event that took place, took place in December. In December, the governing party held its conference and at that conference, adopted a number of policy positions, which we’ve been talking about. Many of us have been talking at various forums here. We’ve also elected a leadership – a leadership that is meant to take our country forward for the next five years and that conference has infused a lot of confidence amongst our people. May I add that it’s not only in South Africa? I’ve met a lot of other people on the Continent and they have been saying, “We’re now filled with a great deal of hope that South Africa is going to continue playing its leadership role on the continent. We’re very pleased with the outcome of the conference that was held in Johannesburg.” I’ve also had the same from number of other business leaders, including political leaders from a number of other countries. So our country has now regained a wonderful stature internationally, globally, and in the hearts and the minds of our people. Many people are feeling like this is a great moment for our country and we can now move forward. I’ve not met a single person (both in South Africa and even here) who has been negative about what has happened. It’s almost as though a seismic event has taken place in our country and all of us are now focusing on what needs to be done, going forward. I didn’t want to tell him that I’d already gone beyond 20 and I had 10 more that I needed to see before the end of the day. But it’s been wonderful, engaging with President Mnangagwa and seeing how Zimbabwe is on the cusp of transforming and they too are feeling that they are facing the moment of their rebirth. We are now looking at a future where we can all work together, and this is the spirit that I believe is permeating amongst all of us. 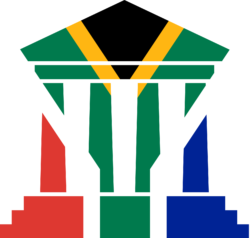 What that conference yielded for South Africa is that the governing party was able to be honest enough to look at the problems that beset our country. I was talking earlier at the South Africa session about some of these issues, but not all of you were there. We were able, at that conference, to look at the challenges that we faced and the challenges that we faced are inequality, poverty, and unemployment. We looked at them once again (as we’ve often done) but this time, what was different was that we said we need to address these challenges but also address what we have been doing wrong because there have been things that we’ve been doing wrong ourselves. The governing party was brutally honest with itself in terms of acknowledging some of the missteps that we have made. What are some of those missteps? There has been policy inconsistency. Many of you here are concerned about things like that. We’ve not been very consistent in our policies and we got to grips on that and said, “If we are going to grow this economy and address the triple challenge we face, (which is unemployment, poverty, and inequality) we’ve got to look at what impedes growth. All those things that are continuously impeding growth in our country: we’ve got to address them and we’ve got to address them honestly. We’ve got to address them directly and it was great to hear the governing party getting to grips with things like that but it also meant that one of the other things that impedes growth in our economy is the whole problem of corruption. In the past, we kept talking about perceptions of corruption and we never really grasped the mettle and this time around we grasped the mettle and said, “Yes, there is corruption and we’ve got to deal with it because it is this corruption that has been permeating throughout the country, which is impeding growth.” Many people who may well have wanted to invest in our country look at us and say, “This is another corrupt country and we’re not going to invest.” So when we as the governing party said we are going to deal with corruption, then we were able to get to a platform/level where we would infuse confidence in the hearts and minds of people. The other issue of course is to deal with the problems that beset our state-owned entities. We’ve all agreed that our state-owned enterprises have become dysfunctional. They have weak balance sheets. 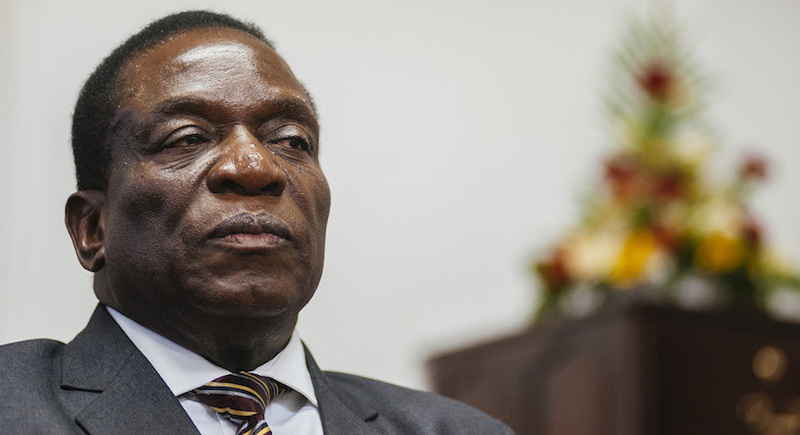 There has been corruption in those state-owned enterprises, weak management, weak governance procedures, and we decided as the governing party that we are going to pay attention to that and address those things. Many of you will have seen already that we’ve started. We started with a big one and this is where I wish to applaud in the private sector because the Minister of Finance and a number of other colleagues have been raising this and saying, “We’re facing a huge problem when it comes to Eskom. We’ve got to do something immediately and we kept thinking that in the next few days or another week, we will do something. It was when a business leader in our preparatory meeting, stood up and said, “Colleagues, we may just as well report to Davos because the Eskom challenge is much bigger than we ever thought. If we don’t attend to it immediately, this country is going to be in serious trouble.” In a number of ways we heard the sound of the penny dropping. The penny had dropped quite a while ago, but that’s when we heard it. Soon thereafter, the Minister of Finance and I said that we now have to go to the President and say, “This problem has got to be resolved, and resolved right away.” The thinking was that we should look at it next week. We said, “No sir. Right now, this problem must be solved or we’re facing a disaster.” What then happened was what we’ve all seen. The board immediately changed. The acting CEO was immediately appointed. Those whom we believed would be found to have been doing wrong things were immediately removed and that just repositioned everything at Eskom. Prior to that, we had received a letter/memorandum addressed to me by 400 senior managers who said, “Deputy President, you’ve got to take action immediately.” Even prior to that, if you may want to know, I’ve been walking with my daughter every morning and a young man came running to me in the street and said, “I work for Eskom. I work in the capital division. There are serious problems.” He said, “Deputy President, we’ve got to attend to this before the end of the week.” All these approaches just meant that action had to be taken. We took action and that has infused a lot of confidence amongst workers at Eskom, amongst many people in the country, and all of us as leaders in the various areas where we are deployed. That already, indicates the steps that we are going to be taking. Some people have said, “Is this a fluke? Is this a flash in the pan? Are we going to see more action?” I can promise you now that based on the resolution that was taken at the governing party’s conference, we are going to be absolutely determined to root out corruption in our state-owned enterprises. We are going to be targeting each of our state-owned enterprises and looking at precisely some of the problems that are taking place there, and we are going to appoint South Africans who are patriotic, South Africans who are capable, and who love their country. We’re going to deploy them in those state-owned enterprises to serve the people of our country and not to serve their own families or their own pockets. That is what we are not going to do. Some of them will be people from the business sector, from academia, and ordinary South Africans who are knowledgeable and capable. We are going to be appointing quite a number of people that we think will be able to devote time and energy to turn those state-owned enterprises. As we do this, I believe that we will be able to instil confidence in the investing community and in our country so that we can immediately be able to turn our economy fortunes around. One of the other things we want to do of course, is promote investment. We want to go out to the world. We want to go out to people who can invest in our country and promote South Africa as an investment destination so we could be coming to a number of you who may well come from a number of other countries and demonstrate to you that we’re deadly serious about repositioning South Africa as a great investment destination. We will be dealing with the regulatory environment and all those matters and difficulties that have been impeding investment coming through to South Africa: we will address them. The most important thing (and this is not a night for great speeches) is that we will be seeking to build consensus. We will be a conference of the governing parties that go out, build consensus amongst key role players in our economy, go and build, and put together a social compact. Social compacts have always served us well in our country. Prior to the demise of our apartheid, we had a lot of violence and through the Peace Accord that was negotiated, we were able to bring violence to an end. Thereafter, we were then able to have a Constitution drafted and beyond that, we are also proud that we have a Reconstruction and Development Plan. That too, was a social compact because a number of people participated in it. It is through the recognition of the Development Plan and it is through a social compact – all of us working together, that I believe we’ll be able to address the challenges that we face in our country. Now, the theme of the World Economic Forum is partly instruction. It is instructive in that it talks about a shared outcome/future out of a fractured world. The world is talking about a shared future out of a fractured world. We, in South Africa, know what a fractured world is. We come from a fractured country/fractured past, which was fractured by the past policies of apartheid and has resulted in the poverty, inequality, and unemployment that we face today. Now with what is being discussed here, I think we can draw a lot of lessons that we can go back and use at home. 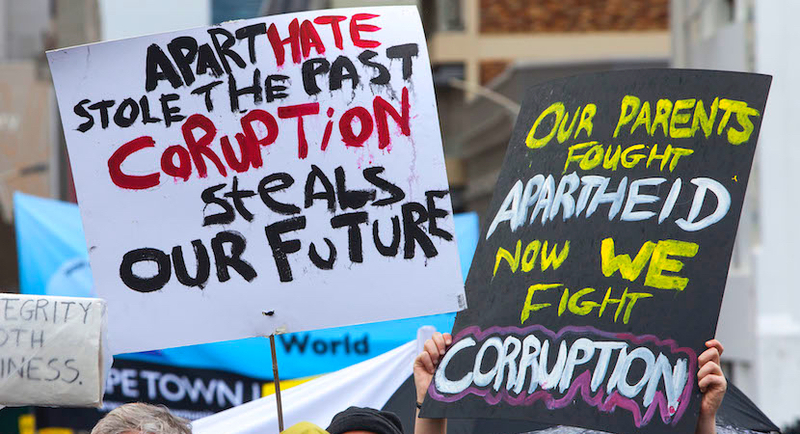 The first thing that I think all of us as South Africans have acknowledged is that we are living in a country, which has a fractured past, a currently fractured present and therefore, it falls on all of us to do something about this. That is the mandate that I have, as Deputy President. 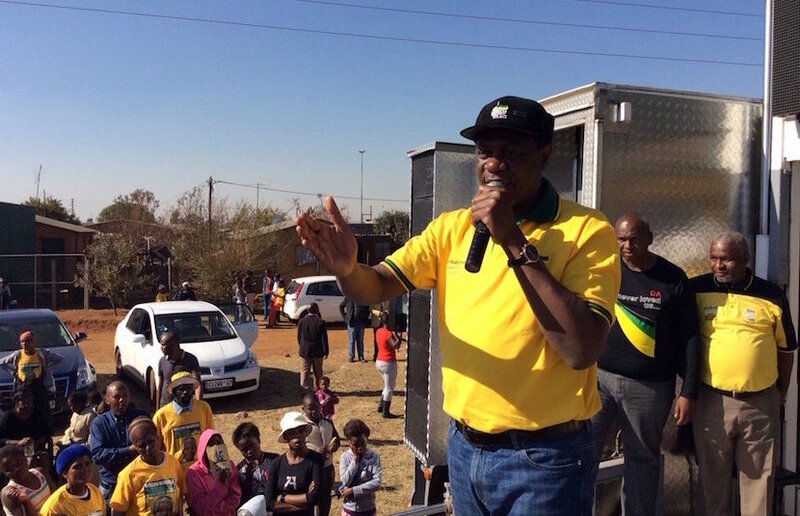 That is the mandate that Paul Mashatile has as the Treasurer-General of the ANC and a number of other colleagues who are members of the National Executive Committee. This is what we want to try because through this platform, we will then be able to grow our economy, make sure that we attract investment in our country, and make South Africa an investment-friendly country. Many other countries are attracting lots of investment. I was told by a governor that yes, our investment traction has gone on a different route, but we want it to go up a lot more. We’re a country that has a great deal of resources – both material as well as human resources. We need to exploit those and make sure that we do attract investors to come to South Africa and roll out the red carpet for investors to come and invest. I will say that we are meeting a number of company executives who have been telling us that they have lots of projects that they want to launch in the country. They have lots of Dollars that they want to bring into the country. If I were to count the Dollars, they really amount to a lot of money that can come into South Africa. I think that on that score, we’ve done very well. We’ve done extremely well in selling South Africa and hoping that those investors will definitely come with their investments. I applaud all of you for the great talks that you’ve been involved in and the way you’ve been selling the country. I think we are well-positioned but it is only when we work together. It is only when this brain trust that is seated here, is able to work together – together with labour and community – that we will be able to move South Africa forward. Now, we’re armed with a great resolution from our conference on this issue and indeed, our conference also resolved a number of other issues; some of which can give you indigestion and some of which can alarm you a little bit but some of the resolutions are things that you’ll be pleased with. What we are seeking to do with what has been decided is to move South Africa forward. Let me be clear on one thing: none of the decisions that we took are deliberately seeking to take South Africa backwards. They are meant to take South Africa forward and if people have questions, challenges, or whatever, we’re open to discussing them because that is what we will do in the consensus building. That is what we will do in building this compact and making sure that everything works. I want to add a movie that I want you to go and see. In my private dreams, I’ve always wanted to be a movie director and I’ve just released a movie. It’s a wonderful movie. It should be showing on the screens at home and it’s a movie that involves four actors. I’m very proud to have gotten to the stage of releasing this movie. It’s about a pride of four lions – four lions who go on a hunt and these lions have identified their prey. They decide that they are going to work together to bring down this prey and they immediately craft a plan on how they’re going to bring this prey down. This is my movie. The one lion moves one way, the other one goes the other, and the other one starts leading the charge. They know that this prey is going to jump the stream and the one is waiting just on the other side of the stream. That is the lion that has been delegated to bring the prey down. Many of you who may watch lion movies, may know that when lions work as a pride and they’re determined, they’re able to bring down a prey very easily. That’s my movie. It’s going to be showing soon and you are all the actors. Every one of us is an actor. It is a great movie. It involves all of us who are seated here and that is what I call compact building. So we’ve got a prey out there. What is this prey? This prey is to get South Africa moving. This prey is to make sure that we create jobs. This prey is about reducing inequality and reducing poverty in our country. I’m saying, “Let’s go get it. 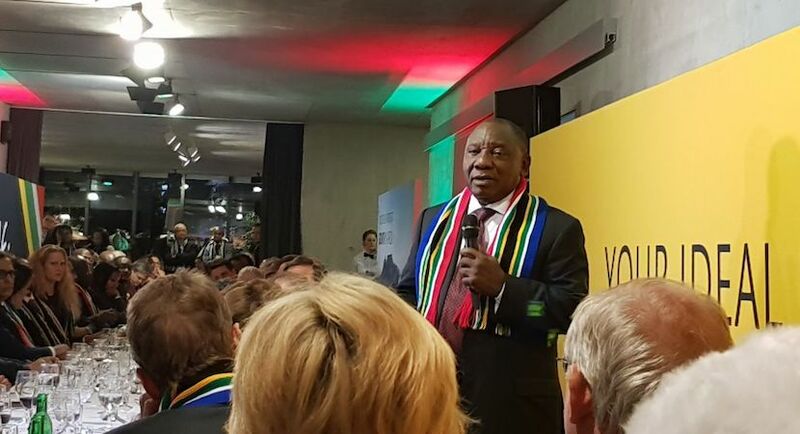 Let’s go bring this prey down.” It’s wonderful to have all of you here at the World Economic Forum, flying the South African flag as we have done, as we are doing tonight, and as we will do tomorrow. I thank you very much for being here.